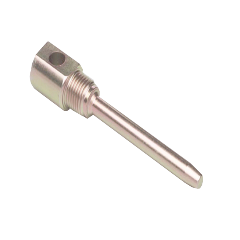 Our hose and fitting assembly mandrels are designed for all straight fittings in Aeroquip 303 and Stratoflex 111 series fluid transfer systems. These hose types are common to most hydraulic, pneumatic, coolant, fuel and oil systems specified in MS33620 for aircraft applications. The quality of genuine MilSpec mandrels is unmatched because we precision machine each piece from premium tool steel, heat treat them for super durable threads and then add a bright Nickel plating for years of service life. Available individually in sizes -3 thru -12 or in an assortment kit including all 7 sizes contained in a durable storage box to keep things organized. Price Breaks : The per each price is displayed with the product. Quantity based discount prices are automatically generated and shown when the item is added to the shopping cart. The breaks at the following quantities: Each, 10, 25, 100 and 250. Please Contact Us for a quote on larger quantities.